For the fourth year running, Stone Temple (now a part of Perficient Digital) conducted a study on how much links matter as a ranking factor. 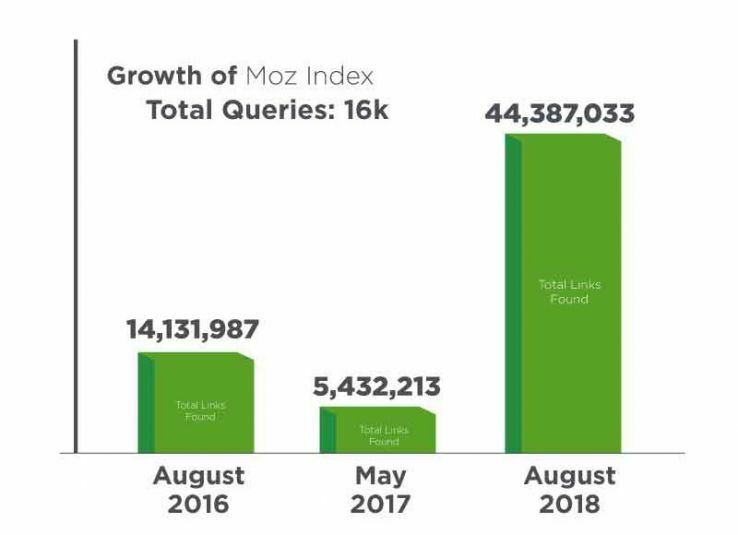 We did that using Moz’s Link Explorer and in this year’s study, we looked at the largest data set yet — 27,000 queries. 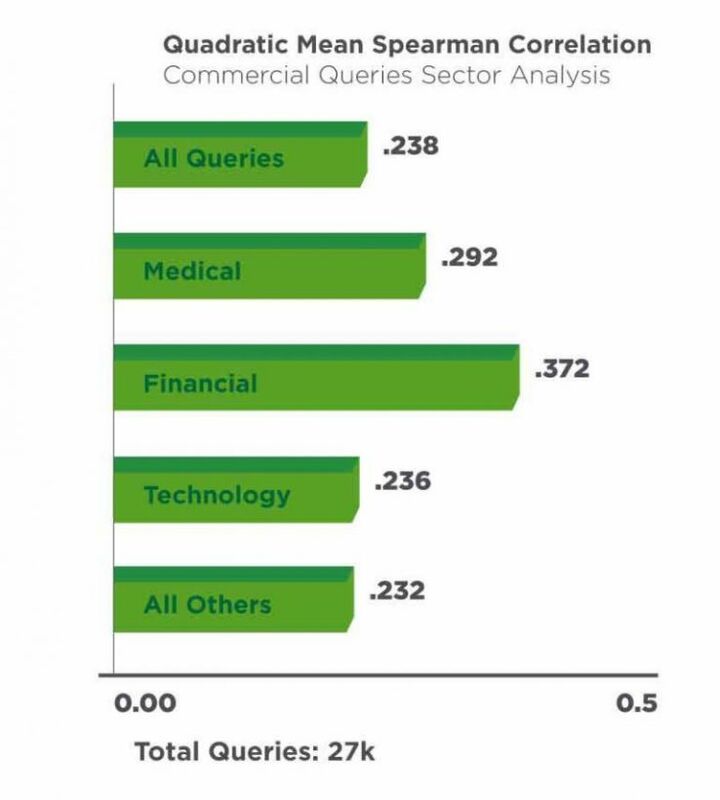 Our study used quadratic mean calculations on the Spearman correlations across all 27K tested queries. Not sure what that means? You can learn more about the study methodology here. That’s pretty significant growth! Congrats to Moz on that improvement. Correlation studies attempt to measure whether or not two factors are related to one another in any way. We use correlation studies to help us understand whether or not one factor potentially causes the other It’s important to understand that correlation does not prove causation; it simply suggests that it does. The example I like to share is that there is a strong correlation between the consumption of ice cream and drowning. That does not mean that one causes the other. In fact, the causal factor here is intuitively obvious — hot weather. People eat more ice cream and people do more swimming when it’s hot outside. But, in the case of links, we also have the fact that Google tells us that links still matter. If that’s not enough for you, Google still penalizes sites for questionable link-building practices. This is not an area they would invest in unless links matter. So how do correlation scores work? A correlation score scale runs from -1 to 1. A score of 1 means a perfect correlation between two items. So if we have two variables (x and y), whenever x increases in value, so does y. A score of -1 means the exact opposite: whenever x increases in value, y decreases in value. A score of 0 means there is no perceivable relationship whatsoever. When x increases in value, y is equally likely to increase or decrease in value. Search is a complex environment to evaluate. Google claims to use over 200 ranking factors. Therefore, it’s quite unlikely that any one factor will be dominant. High scores are not likely to happen at all and correlation scores of 0.2 or higher already start to suggest (but not prove) the existence of a relationship. This correlation score comes in at a solid 0.293 score. Considering the complexity of the Google algorithm’s 200+ ranking factors, having one single factor come in at a correlation score that high indicates a strong level of correlation. Both DA and PA show strong correlations; in fact, more so than the total number of links to the ranking page. 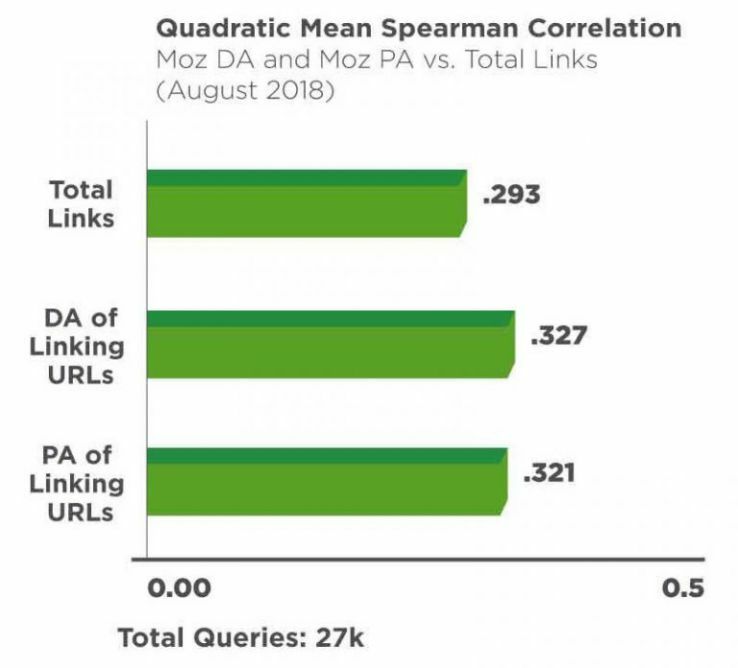 This is interesting because it does suggest that at some level, the authority of the linking site and the linking page both matter. By the way, in the four years that we’ve conducted this study, this is the first time that the DA and PA scores have been a stronger indicator of ranking potential than the pure link count. More broadly, from a link-building strategy perspective, this provides support for the notion that getting links from more authoritative sites is how you should focus that strategy. Now that’s interesting — informational queries show a materially higher level of correlation than commercial ones. From an interpretative perspective, that does not necessarily mean that they matter less. It may just mean that commercial pages get fewer links, so Google has to depend more heavily on other signals. But should those commercial pages happen to draw links for some reason, the impact of the links may still be as high. The data still shows a strong correlation between links and rankings. Google’s public statements and its actions (in implementing penalties) also tell the same story. In short, links still matter. But we also see a clear indication that the nature and the quality of those links matter too! Want more information? You can see the Stone Temple link study here. 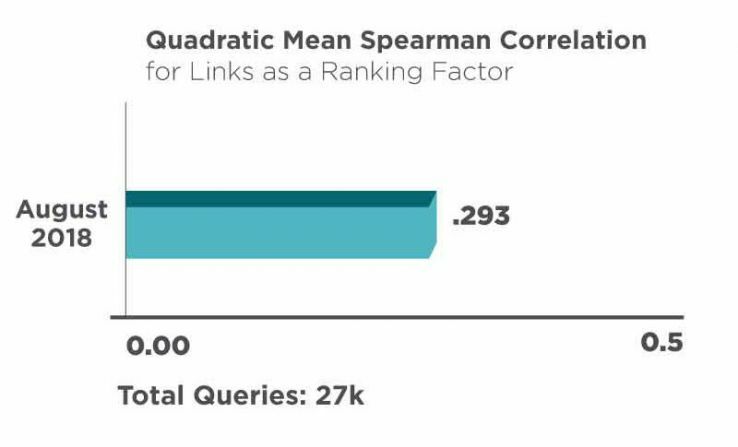 Tell us what you think — do links matter as a ranking factor?